The Ritz-Carlton is known the world over for its relaxed, yet refined, ambiance, and The Ritz-Carlton Residences at Dove Mountain are no exception. This is an incredible community, with hiking trails and access to the amenities at the hotel. The Ritz-Carlton, Dove Mountain is nestled into a canyon in the Tortolita Mountains, with protected desert and mountains all around. The high Sonoran Desert of northern Mexico and southeast Arizona is lush compared to the Mojave Desert of Southern California. The Ritz-Carlton Manages and services The Residences at The Ritz-Carlton at Dove Mountain. These luxurious homes range from 1985 square feet in the $700,000 to million dollar range up to 5460 square feet for under 2.5 million dollars. Average lots for the larger homes are around 1/2 to 3/4 acre. The amenities are superb, the views – spectacular, and the entire community is truly world class. 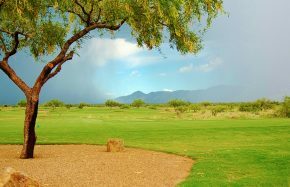 Within this beautiful community is the Jack Nicklaus designed Golf Club at Dove Mountain which is separately owned and managed and is not affiliated with The Ritz-Carlton. The 27 holes of golf are simply astounding. To play on the same course as the best golfers in the world is truly a treat. The top 64 golfers in the world played here at the Accenture Match Play Championship. The course winds through the desert, over washes and arroyos and by thousands of giant saguaro cacti. The greens are large, undulating and fast. The southwest architecture with Yavapai ledge stone and travertine brickwork fits perfectly with the environment. There are spectacular views from everywhere on property. There are also four lighted tennis courts and a fitness center with private locker rooms and lounge areas for members. The 13 acre practice facility includes a large chipping green with multiple levels and contours as well as bunkers, putting greens and a range with 180 degree views of the surrounding valley. Truly a stunning property.